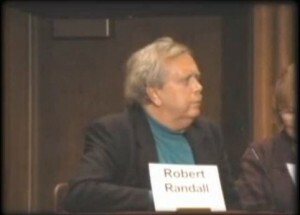 In 1976, Robert Randall became the first legal Medical Cannabis patient in modern America by convincing a Federal Court that his use of marijuana for Glaucoma was a medical necessity. His petition to the FDA for legal Cannabis and lawsuit against the U.S. government resulted in the "Compassionate I.N.D." (Investigational New Drug Program - which still exists, though now excluding Cannabis). Robert recieved Federally grown Cannabis until his death from AIDS in 2001. With Alice O'Leary, Robert Randall founded the Alliance for Cannabis Therapeutics in 1981(the first non-profit organized to change Federal law regarding Medical Cannabis) and wrote several books, including his autobiography, "Marijuana RX: The Patients Fight for Medical Pot". Video from the First Clinical Conference for Cannabis Therapeutics in April,2000, hosted by Patients Out of Time.